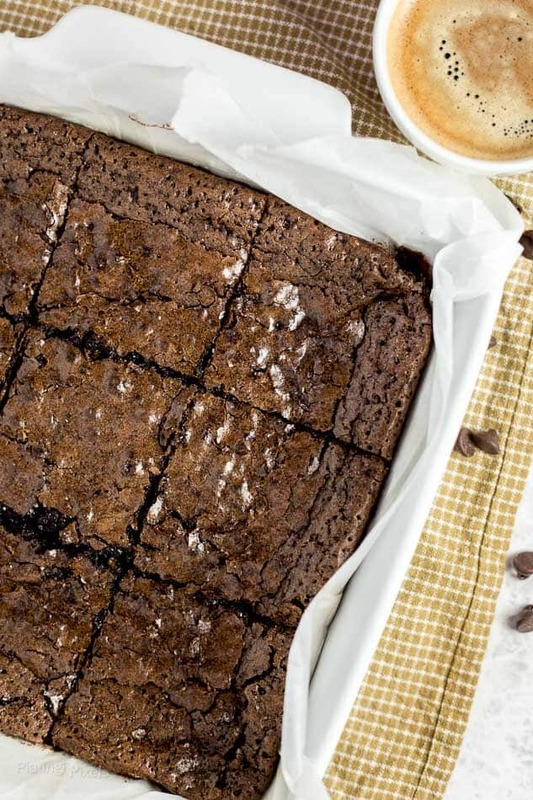 Super moist, melt in your mouth, fudge-like Dark Chocolate Espresso Brownies. Made with dark cocoa powder, dark chocolate and fresh brewed espresso. You probably know of my love for coffee by now. Rain or shine, it’s always there for you. I dare say it’s a critical part of my morning routine. Right after my lemon and ginger water, coffee is the next form of nourishment. I could easily skip a meal, but not my morning cup. It’s not just the caffeine—it’s the flavor, routine and experience of pausing for a moment to enjoy. Plus it allow for more quality time in the morning with loved ones and family. If you’re a daily coffee drinker, then you probably have your favorite ways of brewing at home. Whether it’s a traditional brew, French press or overnight cold brew, there’s plenty of ways to change it up. A new favorite of mine is espresso. And thanks to affordable devices like the Nespresso Inissia and high quality pods from Gourmesso, it’s ready for you every morning, within a few seconds and no need to stop at the coffee shop. They must of known I was a coffee drinker and provided the machine and a few sample boxes of their capsules. High intensity varieties like Etiopia Blend, Ristretto Blend, Messico Blend and Tarrazu Forte sound fancy and add to the whole fun of homemade espresso. I wouldn’t be a proper food blogger if I didn’t use them to make something delicious like these Dark Chocolate Espresso Brownies. 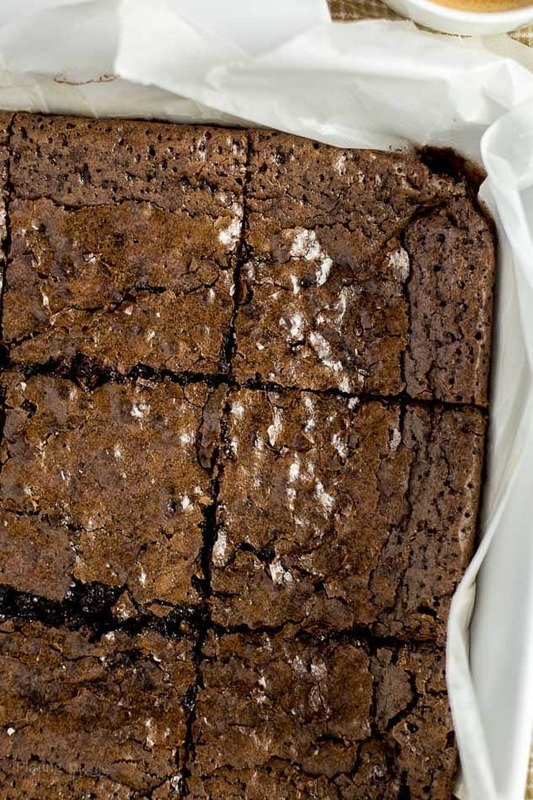 It’s a rich and moist brownie with an almost fudge-like texture. There’s something about rich chocolate desserts. As you can see from my Double Chocolate Hazelnut Fudge Cake, it’s kind of an obsession. Since these espresso brownies were such a hit, I plan to work my way through this list of coffee and espresso infused recipes. With baked goods it’s critical to bake for the correct amount of time. 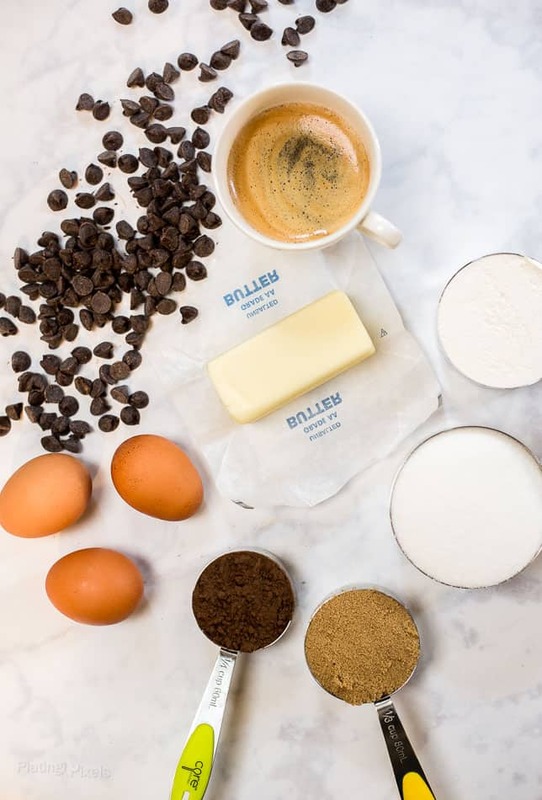 With these espresso brownies, they should be a bit moister than you’re used to (a toothpick inserted will have a moist coating on it). Plus they continue to cook and set a bit after you take them out. Dark cocoa powder, dark chocolate chips, brown sugar, real espresso and plenty of eggs is secret to this Dark Chocolate Espresso Brownies recipe. Pair with with fresh homemade espresso for a you-deserve-it morning treat, a snack or an evening dessert with your favorite ice cream. Any time is a good time for espresso and brownies. Flavor profiles: Chocolate, chocolate and more chocolate, with a subtle espresso flavor. Texture: Extremely moist, almost fudge-like brownies. 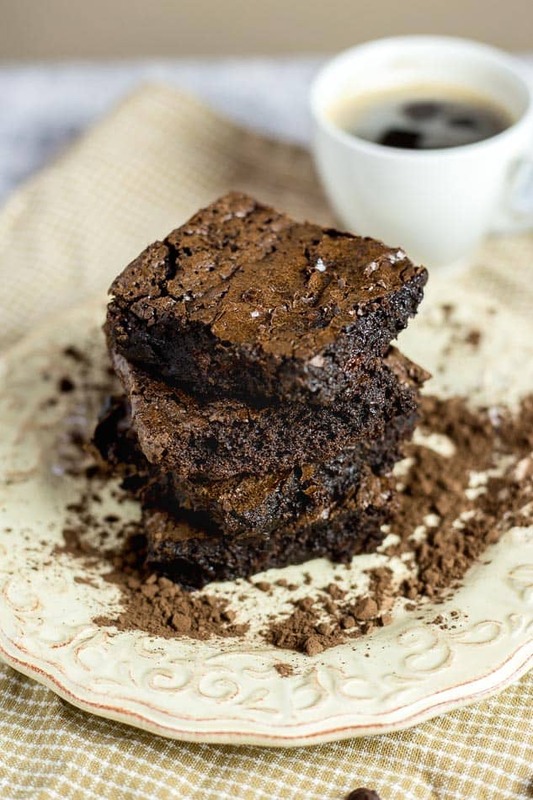 Super moist, melt in your mouth, fudge-like Dark Chocolate Espresso Brownies. Preheat oven to 350° F. Butter or grease bottom and sides of a 9x9 baking pan. Line with parchment paper (up sides as well), grease top of parchment. In a medium bowl, whisk together flour, cocoa powder, salt and baking powder; set aside. Place butter and 3-ounces chocolate chips in a small bowl and microwave in 45-second increments, stirring between, until melted. Allow to cool slightly. 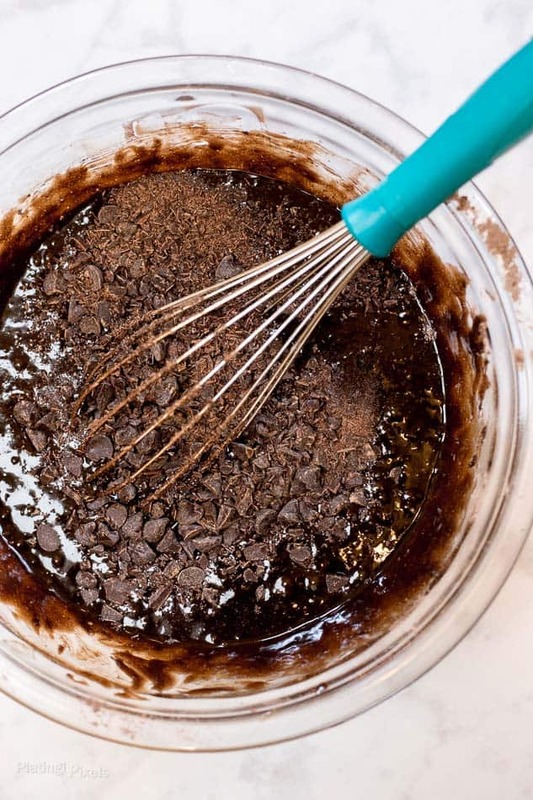 Add melted chocolate to a large bowl. Stir in both sugars, vanilla and espresso until combined. Stir in eggs then flour mixture just until combined. Fold in remaining chocolate chips. Pour batter into prepared baking dish. Bake 35-40 minutes, until top is mostly set and toothpick inserted in center comes out with fudge-like coating. Allow to cool 30-60 minutes, lift brownies out of pan using parchment edges, then cut into squares. Extras (if any) can be stored sealed on counter for a few days, and fridge a few more after that. The first time I made these I put some in a cake. My husband and son ate the rest. The second time I made them they were gone in a day. I’m making them for a third time today and I have a feeling they’ll be gone by Saturday. Wow Keegan thanks so much for the great feedback and glad these were such a hit! Oh boy! Wish I had a sample of those brownies right now! Great looking. I love brownies! I have heard adding coffee brings out the chocolate flavor and these look scrumptious! Cocoa and coffee just go together so tremendously well. I like to add chile to the combination, too, sometimes! Adding espresso makes all the difference with brownie, makes the chocolate so much more flavorful. This recipe looks amazing!